Are you already looking forward to the warm cruise weather and all it offers? I sure am. And just like many of us, once the bustle of Christmas is over and all the decorations are safely packed away (along with those presents that weren’t quite what we had expected), you probably turn your thoughts to what you want to accomplish in the New Year. You might also begin to think about where your next vacation is going to be. The pool deck on Carnival Cruise Line. 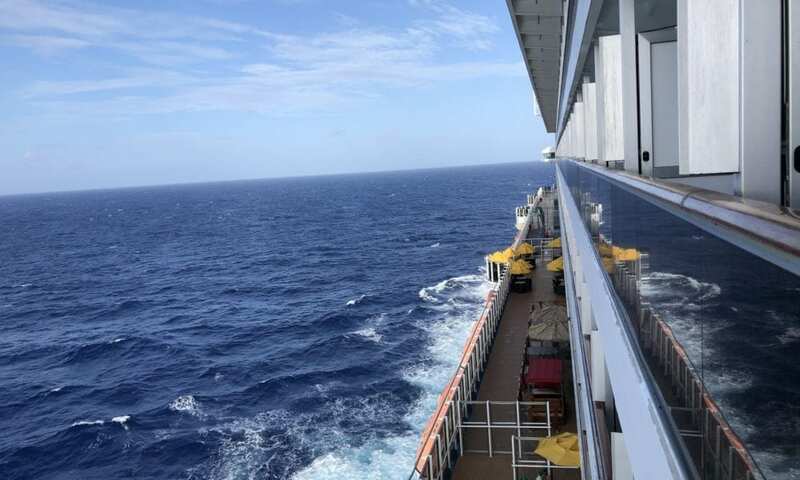 It seems more and more travelers are choosing cruises over other options, preferring the almost-all-inclusive only-unpack-once routine. But, cruising offers much more than that. Guests with children recommend a cruise as the easiest way to take a family vacation. Parents can get some time to themselves since there are so many youth programs and activities to keep children entertained. These programs tend to take kids on active, but short, shore excursions that suit families very well. Those who don’t have children love the idea of daily cabin service — no bed making, no dusting, no cooking… just pure bliss! Travelers who like to enjoy a drink or two (or seven) without having to drive home, or nominate a designated driver, benefit from the available booze packages cruise lines offer. And, because all the drinks are paid for up front, they can simply relax and enjoy their favorite cocktails without the headache of paying attention to the costs. Trying out fine dining or unfamiliar food is another big plus for many. And since most cruises offer exceptional dining, the thought of unlimited lobster, or the specialty dining options available, will have your taste buds tingling. The entertainment is also a massive pull towards a cruise vacation. With exceptional floor shows on offer as well as the best new slots sites for the UK in the cruise ships casino, there is always something to keep passengers entertained. Don’t make the mistake of thinking the casinos you find on cruise ships will be inferior to any other you may visit. Cruise ship casinos offer numerous slot-machine and table-game options. Some ships will use live dealer games while others use electronic methods. Those passengers that enjoy a bet or wager will also be treated to various tournaments of some kind – most of them being buy-ins. This means that once you have bought into a game there is no need for you to spend money during the tournament. From authentic Memphis blues performed live, creative shows and performance spaces, casinos, and youth entertainment, there are multiple options for every type of cruise traveler. Not surprising then that more of us are considering this option for our next vacation.